Our Dubliners campaign is now at 44%. Thanks again to everyone who’s made an order so far! I’m continuing the series of illustrations today with “Ivy Day in the Committee Room”. When de Selby first approached me to illustrate Dubliners, it took me a little while to work out the style (as I mentioned previously), but I knew right away the conceptual approach I wanted to take. I’m always reading in critical studies about Dubliners that it was Joyce’s demonstration that he could master realism before becoming experimental, or that he mastered the Edwardian style before becoming modernist, or something like that. I wanted to take a completely different tack. If you look closely at these stories, almost all of the themes of Joyce’s later work – the medievalism, the religious symbolism, the use of allegory – are already there. They’re not the opposite of Ulysses, but the seed. 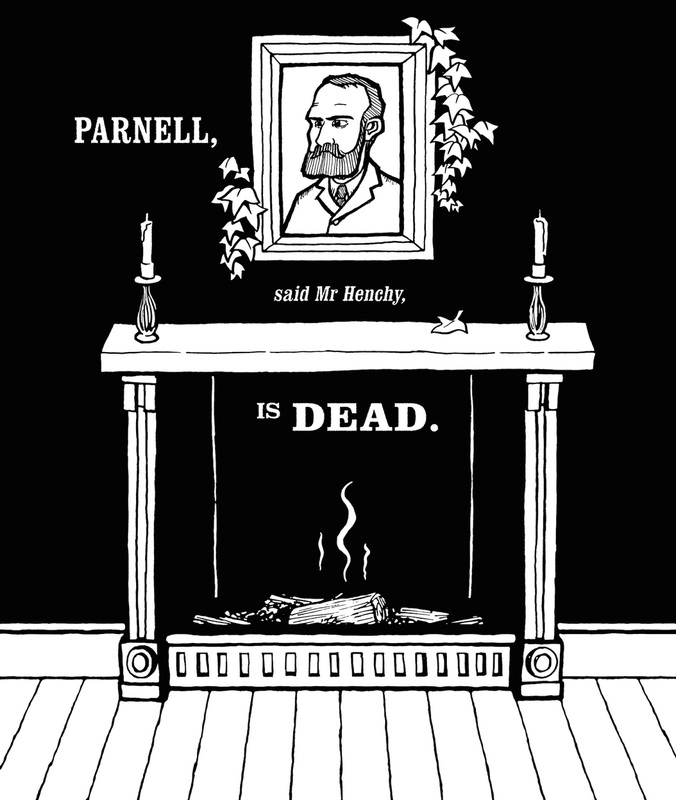 That’s especially true in this story, in which a group of electioneering politicians shelter from the cold on the anniversary of the death of Charles Stewart Parnell. Apart from all those plain words that cats and dogs can read, this story, with all its mixing of the secular and the sacred, would be completely at home in a chapter of Finnegans Wake. So I designed this illustration to bring out the religious significance that Joyce attributes to Parnell in all his fiction. Don’t forget we’re still raising funds for the book! You can preorder a first-edition copy right here. My goodness, I just stumbled here. What an absolute delight...Maybe I'll give the 'Wake' another try (I really should anyways) and enjoy your superb art even more. Thanks for this gift!